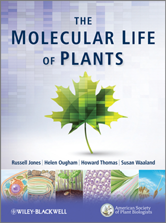 Editor/Author Jones, Russell, Ougham, Helen and Thomas, Howard, et.al. The Molecular Life of Plants presents students with an innovative, integrated approach to plant science. It looks at the processes and mechanisms that underlie each stage of plant life and describes the intricate network of cellular, molecular, biochemical and physiological events through which plants make life on land possible. The book follows the life of the plant, starting with the seed, progressing through germination to the seedling and mature plant, and ending with reproduction and senescence.